Misty Copeland is at the barre. She’s demonstrating a battement tendu to a group of ballerinas at a dance magnet school. The dancers — all girls ages 15 to 17, all in black leotards, white tights and pointe shoes, and all with their hair pulled up into impeccable topknots — listen intently. All eyes are focused on her. Copeland is speaking in English. The teen dancers only understand Spanish. There is a language translator — Maria Luz Pereya, a former dancer herself, originally from Buenos Aires, Argentina — and she offers at one point to bring a corded microphone toward Copeland and translate. Copeland quickly shakes her head, declining her assistance in this moment. This is, after all, Havana, the capital of Cuba, an island in the northern Caribbean where, as they say, the three languages spoken and understood by all are: Spanish, baseball and dance. Misty Danielle Copeland got her start in ballet on the basketball court. The 34-year-old dancer grew up in a family of sports-loving basketball players. Both her biological father and her stepfather played basketball. Her mother, Sylvia DelaCerna, was a dancer and a professional cheerleader for the Kansas City Chiefs, and sports, in general, were very much a part of her household. She hooped a little too, though she says not in any structured way. Charles Barkley was her favorite player, the Phoenix Suns were her favorite team and purple — because of Barkley and the Suns — was her favorite color. Copeland was born in Kansas City, Missouri, and grew up in Southern California. She often spent afternoons at the San Pedro Boys & Girls Club, which was near her school, Dana Middle. Elizabeth Cantine, a school drill team instructor, encouraged Copeland to take a ballet class but Copeland was shy. Life changed dramatically when she was 13 years old, though, and waiting at the club for her mom to pick her up. “I coaxed her down and immediately saw her talent,” artistic director Cindy Bradley said last year. She was there teaching a ballet clinic. Copeland, whose mom was working a number of jobs and was supporting her and her five siblings with the help of food stamps, has recollections as well. “I was playing pool with grown men and whupping their butts,” Copeland remembered with a quick laugh. “And [I was] playing a little bit of basketball, [when] I stumbled into a ballet class that was being held for free on the basketball court by a local ballet teacher who owned a school. [She] was looking for more diverse students to bring into her school on scholarship.” Copeland was a natural, despite starting her study and practice of classical ballet much later than most who go on to become professional dancers. After only three months of study, Copeland was en pointe — supporting her body weight by balancing on the extreme tips of her toes. Misty Copeland goes through leg stretches while preparing to take part in her first class with the Cuban National Ballet on Nov. 15, 2016, in Havana, Cuba. She was a prodigy. But her road to success far from seamless. Copeland almost quit because she didn’t have a ride between the Sunset Inn, the hotel in Gardena, California, where she, her mom and her five siblings lived in two small rooms, and the dance studio. She eventually moved in with the Bradleys — and then found herself at the center of a custody battle — to drill down on her training. Her ascent was astronomical. At 14, she was the winner of a national ballet contest and won her first solo. Shortly after that, she had a featured role in The Hot Chocolate Nutcracker, a multicultural version of the story that was written, produced and choreographed by Debbie Allen. In 2000, Copeland was American Ballet Theatre’s National Coca-Cola Scholar, and she joined the company later that year. And now, the woman known on Instagram and Twitter as mistyonpointe (with a community of more than 1.3 million), is one of the most famous ballerinas in the world — if not the most famous ever, period. Copeland is personally responsible for renewing and increasing the profile of ballet itself. Copeland, with her hair pulled into a low-hanging braided ponytail, is wearing textured black leggings, a black sports bra, and a charcoal tank top — all Under Armour. The most prominent Under Armour endorser next to the Warriors’ Steph Curry, Copeland’s I Will What I Want clip has more than 10.5 million views. And she’s in Cuba because President Barack Obama asked her to be here. In March, Obama met with Cuban leader Raúl Castro — younger brother of the recently deceased leader Fidel Castro — in a historic sit-down and in an effort to restore ties with Cuba. Sending two high-profile American athletes to the country was one of the results of that meeting. Copeland and Shaquille O’Neal are the athletes whom Obama asked to come to a country that Americans haven’t legally traveled to in more than 50 years as part of a sports envoy program focused on Cuban youth. In June, O’Neal was in Havana conducting basketball clinics. And this is the first time the U.S embassy in Havana has partnered with the Cuban Ministry of Sports. Misty Copeland mimics the motions of the dancers from the with Carlos Acosta Dance Company while participating in their class on Nov. 16, 2016, in Havana, Cuba. Copeland’s presence alone makes a strong case. Her physique is on par with other top female athletes — and judging from her many endorsement deals, magazine covers and pop culture influence, it’s not difficult to make the case that she and tennis great Serena Williams are America’s top two female athletes. Copeland is dancing with a group of professional dancers from the “proud, promising” Ballet Nacional de Cuba. It’s a 90-minute class, and after about 10 minutes, beads of sweat start to form on Copeland’s collarbone. Her hands are stretched high in the air and the rest of her body is contorted in a way that only a small percentage of the world’s population can ever hope to achieve. At the class on this particular mid-November afternoon, the weather is 79 degrees — “winter weather,” the locals say — and she’s wearing light brown-girl flesh-colored ballet slippers. Later is when she meets with the group of young female dancers at the magnet school who are working through la pirata and the gran pas de trois, both pieces from Le Corsaire. Elementary-school age dancers with flowers greet Copeland when she arrives. Their eyes light up as she greets them along with her new husband, Olu Evans. But soon she’s ready to help them take their plies to a whole new level. The movement seems effortless for Copeland. She walks them through a four count. Understanding heads nod. The pianist — getting a quick look and a smile from Copeland — starts back up. Of course they get it. 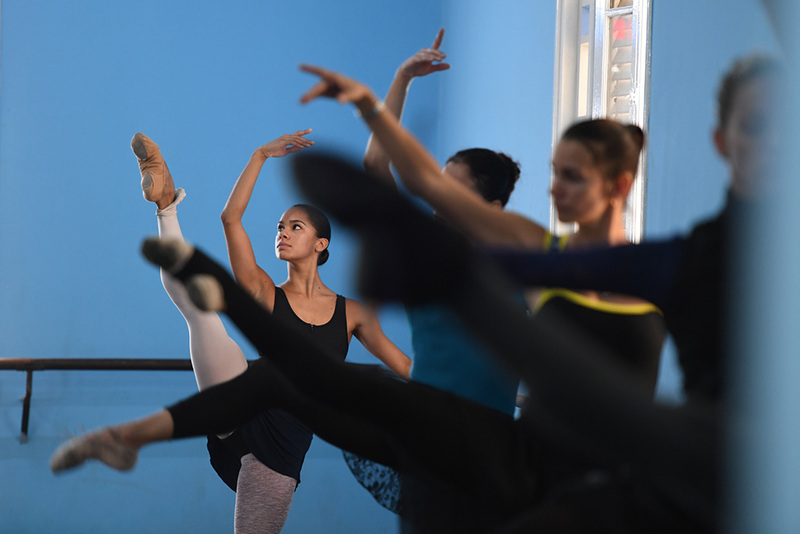 Misty Copeland applauds a performance from the students at the National Ballet School, after leading them through a class Nov. 15, 2016, in Havana, Cuba. By the time the class is done, most of the teen dancers have runs racing up their white tights. Through a series of extraordinary quicktime pirouettes, they’ve kept up, and they’re ready for more. Copeland asks in English if they want to do the combination again. Emphatically, the answer is yes. Her instructions are quick and deliberate. And hardly a beat is missed. We almost never get to see ballerinas up close. Normally, they’re miles away, at center stage and fully made up — or they’re pretty ceramic figurines that twirl around in the center of our music boxes. They’re porcelain dolls, even if they’re flesh and bone. But Copeland’s meteoric rise to fame and transparent behind-the-scenes view of a ballerina’s regimen has meant that we’ve all gotten to see the rugged, raw reality of being a highly trained dancer — from the black toenails to the debilitating back injuries. In real life, Copeland is sweaty. In real life, the trapezius muscles on the top halves of her back tighten into wings as her body soars nearly two feet off the ground before landing into a plie. Before her season begins, Copeland is in ballet class for an hour and a half every morning. On top of that she rehearses about eight hours a day, five days a week. In performance season, she’s working out six days a week and rehearsing five hours a day — and performing three hours a night. Misty Copeland watches as members of the Cuban National Ballet warm up Nov. 15, 2016, in Havana, Cuba. The thing Copeland is most vocal about is the lack of diversity in ballet. But being in Cuba was a moment to not stand out. Copeland was surrounded in brown diversity, a far cry from the stridently white world of classical ballet. Quite frankly, it’s a mutual admiration society. At nearly every dance space she graces in Cuba, the dancers — men and women — crowd around Copeland after they perform for her and ask through her translator to take selfies and group photos with her. After a class with instructor Loti Peon of Carlos Acosta’s dance company, two of the principal dancers put on a show for Copeland that leaves nearly everyone in the studio speechless, unable to form words after witnessing the ways their dark brown forms contorted and intertwined. Misty Copeland doesn’t want to be the first and the last. She refuses to let that happen. Lois Nam is a senior digital producer at The Undefeated. She still owns the VHS of every Sixers playoff game from 2001 and will never throw it away.